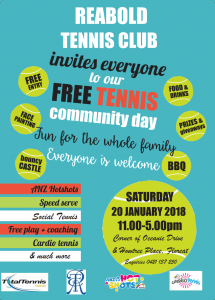 Saturday Social takes on a Roland Garros theme with a French Open afternoon tea, come down for social play from 2pm - 5pm, with the afternoon tea in the middle. Saturday Social takes on a Wimbledon theme afternoon tea with Pimms, strawberries and cream, come down for social play from 2pm – 5pm, with the afternoon tea in the middle. To celebrate Father's Day we will be holding a special afternoon tea on Saturday the 1st of September coinciding with our Saturday social tennis. Come down for tennis from 1:30pm onwards and enjoy the special afternoon tea break in the middle. Due to the Junior Tournament running from the 29th of September until the 2nd of October there will be no Saturday Social on that weekend. Reabold Tennis Club will be running a Twilight Tennis event on Friday the 28th to make up for it. 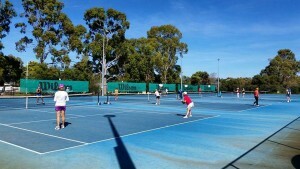 Enjoy the twilight social tennis and stay afterwards for gourmet pizza. Reabold's annual Junior Tournament, the four day event will attract many up and coming junior tennis players and is a great event. Opening Day is one of the most exciting Reabold events of the year. It marks the opening of the grass courts and the return to (hopefully) pleasant weather. 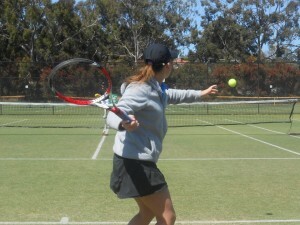 The event will consist of the return to social play on the grass courts and a meal afterwards. The Tuesday ladies host an annual Melbourne Cup Lunch following their social play. Get out your fascinators and other fancy headwear and enjoy the race and a great lunch. The most glamorous social event of the year returns, a celebration for the members to dress up and enjoy amazing food and celebrate the club. Christmas is just around the corner! Come and celebrate it at Reabold with tennis, carols, food and children's activities. 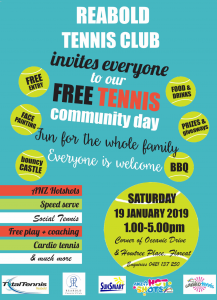 Reabold's free Community Tennis Day enables anyone from the local community to come down and enjoy some tennis for free. Suitable for all ages and skill levels and is a great day in your local community. Celebrate Australia day with Reabold, with a special afternoon tea during social play, and a BBQ afterwards. A Special afternoon tea to celebrate your loved ones. A musical spin on traditional bingo, a great night with your favourite retro music, friends and bingo. Celebrating all of the Reabold mothers with a special afternoon tea.